Another GM brand that needs a clear strategy is GMC. The fact that GMC still sells Chevrolet trucks and crossovers with small design changes, proves that GM learnt absolutely nothing from the whole bailout thing. And that they will probably need another bailout when the global car market will be in trouble again. 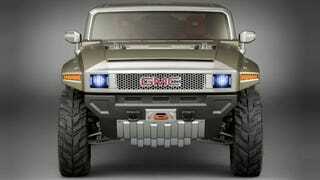 GMC needs to become a Jeep and Land Rover rival. It’s crazy that GM can afford the luxury of having a brand that only sells trucks and a couple of utility vehicles. GMC needs a Wrangler rival(modernized H3 and H4 would do at first). It also needs a pair of rivals for the Cherokee and Grand Cherokee duo. Those cars can share some parts and sub-platforms with other GM products, but they need to look different, feel different and be significantly better off road. Small GMC could also be a good thing, but that needs to be a lot more than an American Kia Soul. It needs to be just as good as the Renegade Trailhawk off road. The Yukon could stay, but it needs to get a lot lighter and off road focused. GMC can also keep a truck, but it needs to give the Ford Raptor a run for its money, or else it isn’t justifying its existence. Ultimately, promotion is key. Enter GMC in the Dakar rally. Win it. Own it. Try to convince the light vehicle suppliers of the armed forces to add your badge on their products. You know, like a title sponsorship.